Good morning everyone. This week has flown by. Seems I did not accomplish half of what I wanted to. Oh well at least there is tomorrow (I hope). Here are a few Mother's Day Cards. The first 2 were created using some beautiful images print on the oval layers which were then layered on top of 3 other layers. One of which was embossed. Left both of these cards blank on the inside. This last card was created by scanning a old vintage card. Then was printed to the front of a card base. Sentiment was also printed to the inside of the card. They are all beautiful cards! !Love the embossed background.I love the darling vintage card!! They are all so lovely Nana! Great Mother's day cards! What a great set of cards! I love the embossing on the first two! Very pretty cards! 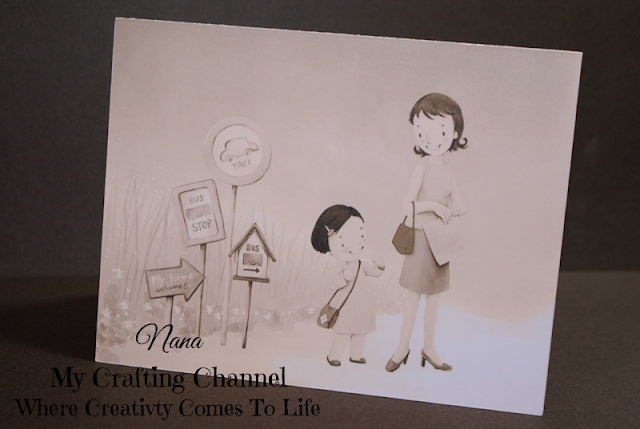 I love the vintage design of your 3rd card, the scene is so classic. The images are fabulous and the embossing looks amazing! What a beautiful cards!! Love them all three!!!! Have a great day. Beautiful cards! The first two are very elegant and lovely. And, I love the vintage look of your last card - how fun!